Product Options are a great way to offer your customers a choice when purchasing from your Shop. They allow you to sell variations of one item, allow personalisation and combine similar items. This broadens your customer's experience whilst improving the usability of your Shop. 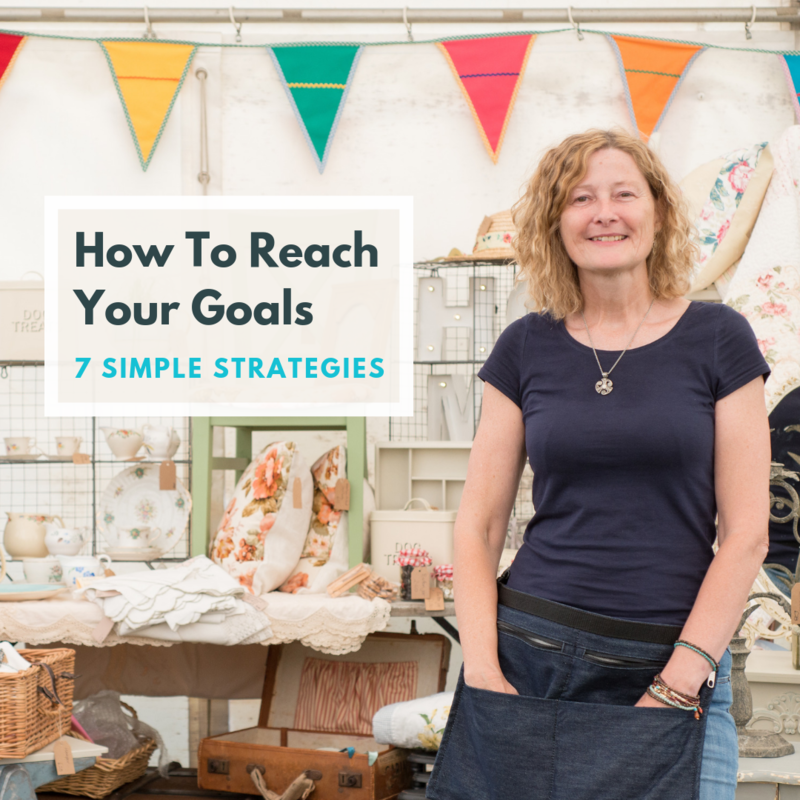 In this guide we will be looking at how to create your Product Options and the different specifications you can set. To go to your Product Options area you will need to go to your "Shop" area from the Top Menu and select "Product Options" from the left-hand menu. Here you can put the name of your Product Option in the "Name" field. For example, if you are selling t-shirts you may wish to allow your customers to select a colour, in which case you would create a Product Option called “Colour”. You can then decide whether you would like this Product Option to be mandatory for your customer by selecting "Yes" or "No" in the "Required" field. This window allows you to create an "Item" for your Product Options. For example, your "Item" for colour may be "Blue" or "Red". This will allow your customer to choose their item from a drop-down list. 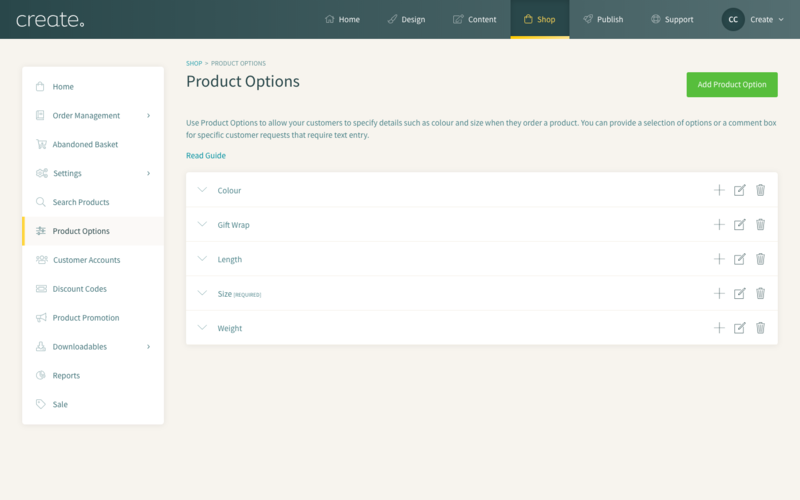 For example, if you were to use "Colour" as your Product Option you could use a drop-down list to display the different colour options available to your customer. This will give your customers the ability to personalise the products you are selling. For example, if you were offering a personal message on your t-shirt you would add a custom text box for your customer to write the message in. This message will then be sent with the order details to your Order Management system. With these options, you can choose whether to have a "Single-Line" or "Multi-line" field. This will dictate how long the personal message can be. 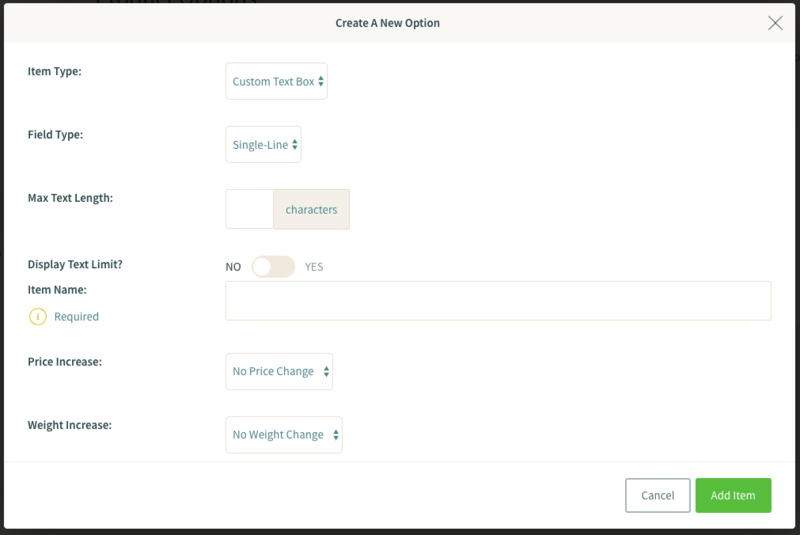 Additionally, you can choose a maximum character length and whether you would like to display this on your product page. Once you have chosen your "Item Type" you can choose your "Item Name", such as "Blue" or "Red". Or, if your Product Option is a size, your item could be "8" or "10". The next field, "Price" gives you the option to increase or decrease the price of your product when this item is chosen. For example, if your blue t-shirt was more expensive you could select "Increase Price By" and enter the amount you would like to increase the price by. You also have the option to have "No Price Change". The "Weight" field allows you to increase or decrease the weight of the item, based on the option your customer chooses. You can also opt for "No Weight Change". 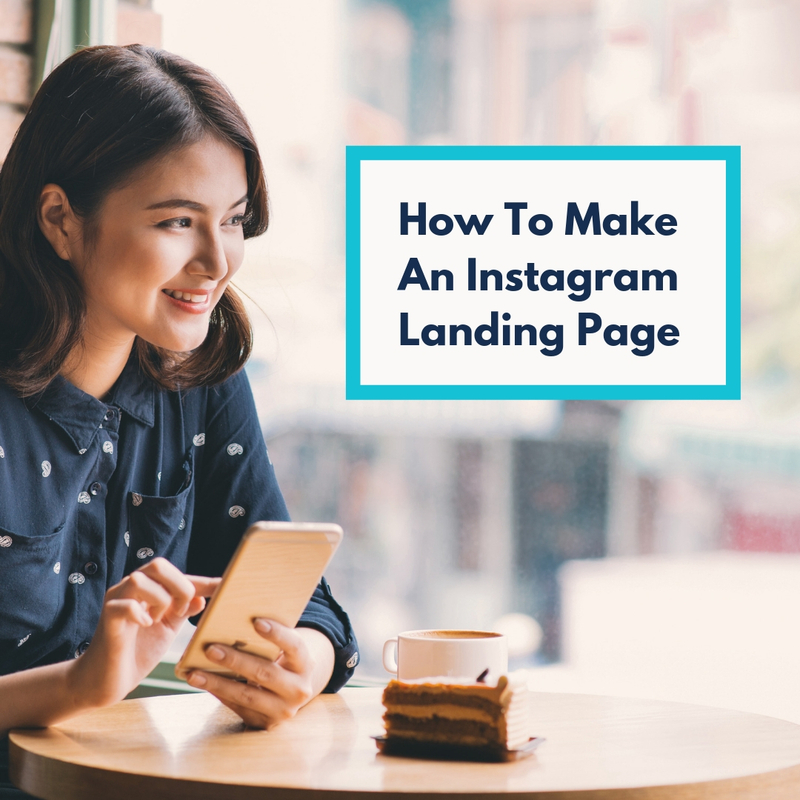 This is particularly useful if you are using Product Options to sell different quantities of one item, as you can alter the weight accordingly. It will then automatically change your Postage cost if your Postage & Tax setup is banded by weight. Lastly, the "Default Option" field means you can choose whether this item is included in every product that uses this specific Product Option. For example, you may have only one t-shirt that comes in green and so you would set your "Green" item to "No". 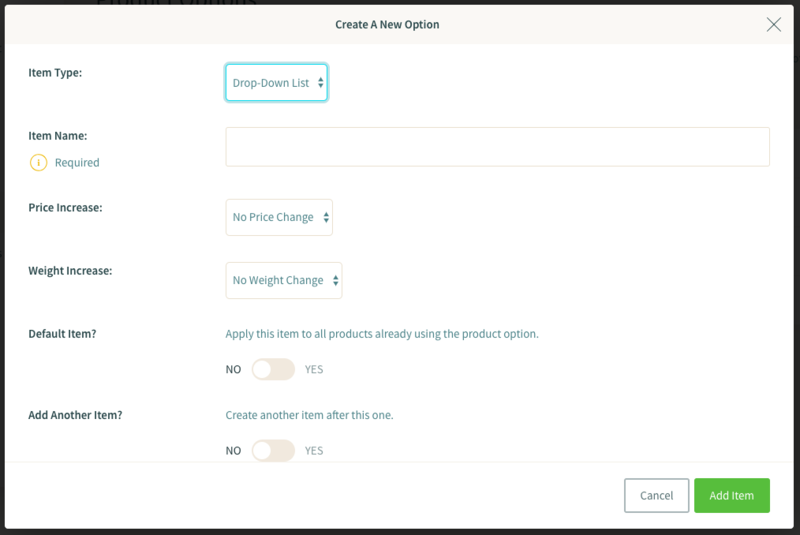 Then when you have added your Product Option to your product you can choose to add this optional item. Once this is completed you can save your item and continue to add more items by selecting "Yes" in the drop-down list, then "Add Another Item". If you're done adding items, you can save this item and return to the main Product Options screen by selecting "Add". If you would like some more information on Product Options, why not take a look at the guides below?